DK Mountain is the fourth and final race track of the Star Cup in Mario Kart: Double Dash! !, and the third track of the Lightning Cup in Mario Kart Wii. The course takes place along two volcanoes in the middle of the jungle. The center of the track is a giant Barrel Cannon that shoots racers to the upper part of an active volcano. The course itself is complex, containing several curly paths, dangerous, tight turns and an uneven ground where drifting is difficult to control. All players start the race in the jungle. As they start the race, the players go to the base of an inactive volcano and take a curved path surrounded by the crater of this volcano. Racers are soon fired at 195mph / 314km/h (GCN version) by the DK Cannon, onto an active volcano. While airborne, racers are invulnerable to items. After landing near the top of the mountain, drivers now have to drive downhill on rugged terrain. Almost at the base of the active volcano, racers happen on a road prone to falling boulders. Reentering the jungle, players take a zigzagging path where more boulders roll down hills. During the first turn, racers should avoid falling off the cliff while swerving around. A second turn surrounds a deep ravine where players may fall. Lastly, the third tight turn leads racers to a swaying, windy rope bridge high above a deep canyon. This leads racers to the finish line. The course has one shortcut during the descent of the zigzagging portion. Just after the first tight curve, players can instantly jump across the ravine to reach the other end of the second turn. This saves them a few seconds in the race. 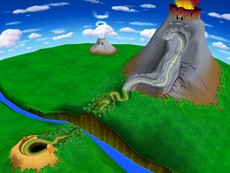 DK Mountain is in the background of Baby Park and Dino Dino Jungle. The course in Mario Kart Wii. 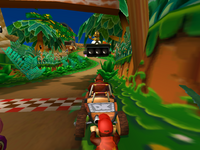 The course reappears as the third course of the Lightning Cup in Mario Kart Wii, but in this game, some elements were added, such as ramps and mud to replace deep grass. Also, the sign that says "Donkey Cannon" in Double Dash!! now says "DK Cannon", in common with DK Summit. On the course map, the straight line declaring players being fired out of the cannon was removed. The straightaway down from the top of the mountain now has wooden ramps for racers to perform a trick. Racers can also either stay on track or go off-road without losing speed, granting an advantage to avoid other racers and hazards set in the slope. In the falling boulder section, only giant boulders flip racers, whereas the smaller ones disintegrate and slightly decelerate the kart. Vertical dash panels have also been added on the first switchback and the ravine was made larger so racers cannot jump over it. A tournament took place on this track. Players had to pass through a total of 20 gates, with the bridge being replaced by Mushroom Gorge mushrooms. It was the second tournament of January 2010, and it was restricted to Wii Wheel controls. It was later repeated as the second tournament of September 2011, the first tournament of December 2012, though without any control restrictions, and the second tournament of February 2014, with the Wii Wheel restriction kept. Official European website: "If getting fired to the top of a huge volcano isn't dangerous enough for you, the cliff-side drops and ramshackle bridges might increase the fear factor as you race around DK Mountain." In the overview map on the official Mario Kart: Double Dash!! website, as well as the picture at the top of the page, the wooden bridge is missing. This is due to the fact that it is its own object and not part of the level geometry, so it is capable of swaying. This track shares the same music with Dino Dino Jungle. Part of this track's music is an arrangement of the Donkey Kong Jr. stage music. Mario • Luigi • Princess Peach • Princess Daisy • Yoshi • Birdo • Diddy Kong • Bowser Jr. This page was last edited on April 25, 2019, at 17:40.